Discovering this emphasis in theology has been for me a most transformative experience. As Dougls Hall states “God hates most religions … they are driven by egocentrism and other directedness.” In the cross we are driven towards this scarred world. As our Lord moves with the weight of the cross we are invited to do the same …sharing shame and pain and suffering but still moving towards final culmination. This is our hope , our faith as we serve. The cross is an offense. It offends our sensibilities nurtured largely unknown to us by this world of brightness, success, competitiveness,progress and glory.Who in this world moves themselves or their loved ones towards failure, execution, shame and bloodletting? 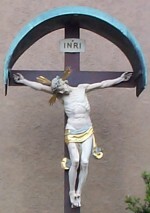 How then can we move towards the cross or even more unthinkable how can we uphold the cross as a human symbol of worth? Jesus embraced it. This I cannot erase from my mind. Further He asks that we also corry the cross. This ultimate challenge of both moving away from yet closest ever to this world that He loved screams loudest to me.